Could north end up winless this year? I think he means SM North, Fightin' Eagle and the answer is definitely yes. I don't so how they can win a game after this. The Indians are now officially the new Leavenworth. No way did I mean Olathe north. They'll end up probably around 6-3 5-4 this year, I was talking about SMN! Wow. That was a beating. Only question is North that bad or is LV legit? Need a larger sample size for sure... Beat South! I just can't believe that LV has improved that much and we all knew the cupboard was pretty bare on Johnson Dr., but apparently it's even worse than we thought. Going to be a long long year for the Indians. At least they don't have to play in the rain tonight. Always look on the bright side. Southside 6A 2011 State Champs, here they go again. Have seen that line and those three D-1 guys that transfered from a Florida school? WOW! They are HUGE again. Watch out, this could get ugly in the Sunflower League. 2-0 Lancers. Safety on the first series. This ones gonna be ugly. Maybe not. Weather looks like its holding the East offense back. SMS is going to run Guild to death, has around 10 carries already 2 series in. 9-0 SME. Lancer D is looking solid. Darling tosses first TD. Bad weather still hurting Lancer O. SMS is a one trick pony and East is keeping Guild under wraps. Guild getting going a bit now. Kid is tough as nails. Wow, bad week for theimp. Great week for SM football though. Congrats Coach Hibbs, congrats Vikes, vikingstudent you'll have to give me a rundown if you were at the game. And, yes, congrats falcons, a brief heart flutter when the East back picked up that fumble and broke into the open in the 4th but you escaped. I thought Coach Myers really screwed the pooch by not punting on 4th down at his own 45 with 10 minutes left. In those conditions, play for field position. The conditions at ODAC were so terrible on that grass... it was really hard to evaluate either team. Olathe South had more weapons but it was virtually a chess match of whose QB would fumble less snaps. One thing that did jump out at me about Olathe South was their senior leadership. Matt Elliot's pick in the endzone and 50-yard return, Chase Hanson's 76-yard TD run, Remington Whitley's control of the middle... there's much to be said for a team whose seniors stepped up and basically controlled the outcome like that. Very surprised with the SMW & SMNW wins tonight... Not going to read too much into it because of the weather. But still very nice wins to start the year. On a Lancer note... Their defense of line and LBs were pretty darned good tonight. Stewart twins were in on every play. #58 (forgot his name) was a beast starting both ways on the line, he's better on D as he did miss some blocks. I'd flop our OTs and have that 300+pounder protect Darlings blind side. Darling showed a little bit despite the rain, he had one really nice downfield ball but that was about it. Don't really like playing ON after a loss but I'm glad it's home... Maybe we can beat Gene Weir for the first time ever. All I'm going to say is... The Viking defense is the real deal this year. Verdini fumbled a couple times, and threw a pick. First game jitters, and weather though. But we contained brad very well. We fumbled twice in the last 5 minutes on the 10 yard line. And we just kept Knocking balls down and even got a couple sacks. We basically tried to let them win with all the fumbles. It was insane. Olathe East has major Coaching concerns. Has his time past. What was that guy thinking when he went for that 40 yrd field goal in the rain? That gave Olathe South their first field position of the game, and Chase Hanson made him pay for his terriable mistake. Make sure Coach that you say sorry over the loud speaker at school Monday to all players and students. Nice observation Pitt 80. When it came down to crunch time Coach Meyers had nothing but power I off Tackle. Has the guy ever heard of counter, boot, or play action. And as usual way to let the clock run down with timeouts available. THe East kids played their hearts out but they have to contend with their opponents as well as their Coach. On a happier note great tribute to Nathan Trinkle. His Brother Branden played his heart out the entire game. God bless your family! Free State didn't seem to have any issues with the weather. THE team to watch this year! Free State plays on turf, ODAC was a swamp by the end of the first half. Both teams lost alot in speed and footing. The RB's looked like Fred Flintstone trying to start his car in that mud. Free State beat ONW at CBAC, my friend. Same mud... same swamp conditions by halftime. Oh, and FSF, yes good first game but next week you'll have to play a team that actually has a defense. We'll get a better measure next week. 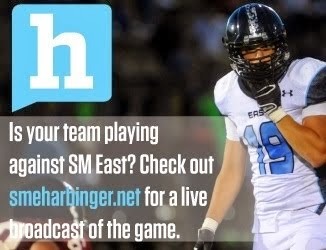 Great games next week: LFS @ SMW game of the week but also SMS @ LV and ON @ SME and LAW @ SMNW. going to be some tough picks. Oops. Thought it was at free state. Well, good job then. Hey, Impaler, did you ever think you'd someday rank Leavenworth over Olathe North? No, gov. A topsy turvey first week to be sure. Gonna try to get to the LFS SMW game this week. Should be fun.